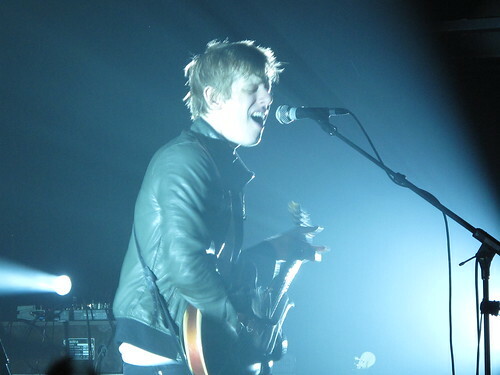 Spoon is an American indie rock band from Austin, Texas. The band is led by Britt Daniel (vocals, guitar); Jim Eno (drums); Rob Pope (bass) and Eric Harvey (keyboard, guitar, percussion, backing vocals).The band was formed in late 1993 by lead singer/guitarist Britt Daniel and drummer Jim Eno. The original lineup also included Greg Wilson (a.k.a. Wendel Stivers of the song "Theme to Wendel Stivers") on guitar and Andy McGuire on bass. The name Spoon was chosen to honor the 1970s German avant-garde band Can whose hit song "Spoon" was the theme song to the movie Das Messer. Eno describes Spoon's music as "rock 'n' roll."